"Hare Krishna, Hare Krishna, Krishna Krishna, Hare Hare/ Hare Rama, Hare Rama, Rama Rama, Hare Hare"
"The names of the Lord and the Lord are nondifferent. So Lord Krishna's instructions to Arjuna to 'remember Me' and Lord Caitanya's injunction to always 'chant the names of Lord Krishna' are the same instruction. 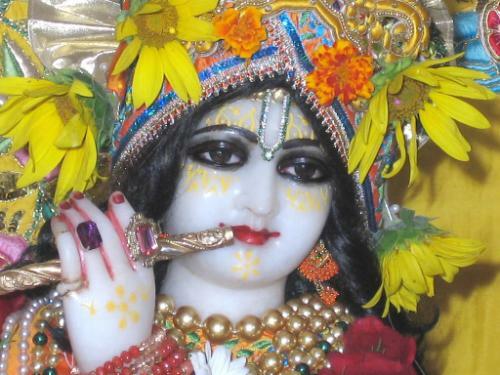 There is no difference, because Krishna and Krishna's name are nondifferent. In the absolute status there is no difference between reference and referent. Therefore we have to practice remembering the Lord always, twenty-four hours a day, by chanting His names and molding our life's activities in such a way that we can remember Him always. "How is this possible? The acaryas give the following example. If a married woman is attached to another man, or if a man has an attachment for a woman other than his wife, then the attachment is to be considered very strong. One with such an attachment is always thinking of the loved one. The wife who is thinking of her lover is always thinking of meeting him, even while she is carrying out her household chores. In fact, she carries out her household work even more carefully so her husband will not suspect her attachment. Similarly, we should always remember the supreme lover, Sri Krishna, and at the same time perform our material duties very nicely. A strong sense of love is required here. If we have a strong sense of love for the Supreme Lord, then we can discharge our duty and at the same time remember Him. But we have to develop that sense of love."